The week in which: master architects take on gingerbread, and an astonishing number of great restaurants raise money for immigrant rights. 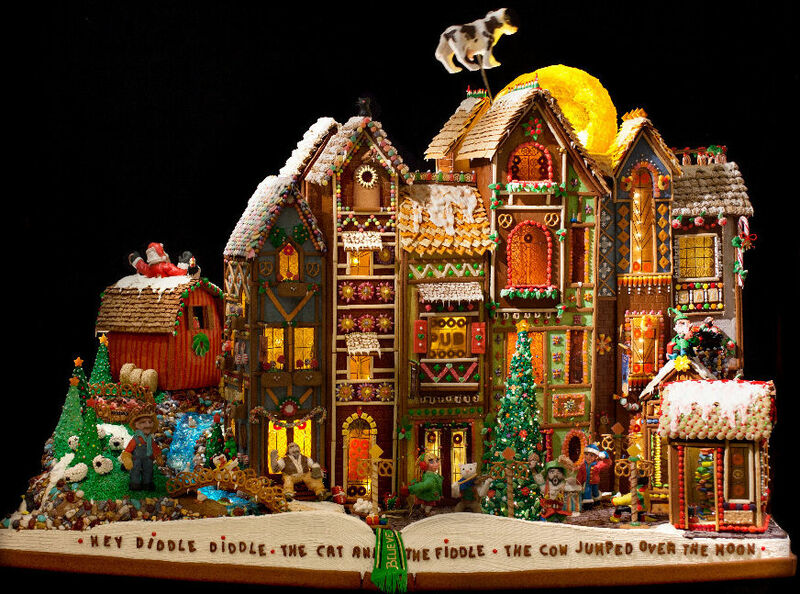 Calling all confectioners: the Sheraton is throwing down mass quantities of gingerbread and royal icing in preparation for the 26th Annual Gingerbread Village. The tuxedoed staff of El Gaucho are lighting a few extra candles at their Bellevue steak house this week, after celebrating 10 years of Angus beef and parmesan-topped Caesar salads. To commemorate, put on your festive attire and whisk your sweetheart out for specialty cocktails like “For Whom the Bridge Tolls” with brandied cherry, and “Allen Aviator” with crème de violette, paired with a specialty 10 for $10 menu of shrimp louis, lobster tempura with vanilla tossed arugula, and crepe suzette. And on Nov 14, they’re hosting their partner of the month: 38 Jubilee REACH kids, for an evening of tableside preparations and career discussion. Talk about cooking for a cause. Over 120 local restaurants, cafes, bars, coffee shops, and bakers are firing up the ovens to raise money for immigration rights. Snag bánh cuốn from Ba Bar, a scoop of honey lavender from Molly Moon’s, pork belly and carnitas from Neon Taco, and many other snacks and sweets from the massive list of participating businesses, as 10 percent of their profits will benefit the Northwest Immigrant Rights Project. Who was there on the cold and rainy evenings? Hot Cakes. Who was there when our bestie needed a pick-me-up? Hot Cakes. Now, we celebrate this beloved Ballard and Capitol Hill cakery and its 10 years of molten goodness. On Nov 16, rejoice with a birthday-flavored rendition of the cake that started it all. Oh, and the first 50 party guests at Ballard by 6:30 win a free Hot Cakes tote bag filled with goodies from partners like Frankie and Jo’s, Patagonia, and Blue Star Coffee. Cue the sprinkle cannons. Urban Craft Uprising’s 2017 Gobble Up was a hit, but now they’re gearing up for a 2018 food-themed version. Head out to the Bell Harbor Conference Center on Pier 66 for an artisanal food festival showcasing more than 100 craft food makers of the Pacific Northwest. It’s free to attend, and a perfect opportunity to snag last minute holiday gifts and goodies while perusing bounties of craft samples from many of our local restaurants and small businesses. Sure, Thanksgiving is all about the turkey feast. But Ethan Stowell’s Mkt in Tangletown is throwing down a pregame. Lamb feast–style, that is. Indulge in three lamb-centric courses of strozzapreti with lamb ragu, lamb tartare with champagne vinaigrette and seeded crostini, and a spiced pear almond terrine, because there is always room for dessert showered in streusel. Reservations are required for the intimate 28-seat open kitchen, and for an extra $35, throw in the all-too-tempting wine pairings. Because no matter what the haters say, it is never too early to cue Michael Buble’s Christmas album and begin the wintry holiday festivities. For 26 years, the Sheraton has celebrated the Annual Gingerbread Village benefitting the Juvenile Diabetes Research Foundation. This year, Seattle’s top architecture firms, master builders, and Sheraton culinary teams embraced a fairly whimsical destination: Whoville. View a sugary interpretation of the Grinch’s Mt. Crumpet, the city’s main square, and of course plenty of Whos prepping for Whobilation. This year, it’s Female Powerhouse Edition in the return of “The Best Chefs You’ve Never Heard Of.” Celebrate female chefs and mixologists at the Four Seasons Hotel ballroom where emerging culinary leaders will create a tasting of seasonal bites and drinks. These chefs, from restaurants like Lark, How to Cook a Wolf, Reckless Noodles, and Monsoon, will help raise funds for Washington’s leading hunger relief agency, Northwest Harvest. Tickets are $75 and include an appetizer and main bite from each of the eight chefs, plus two drink tickets. Please event details for consideration to noshplanner[at]seattlemet[dot]com. Thank you.